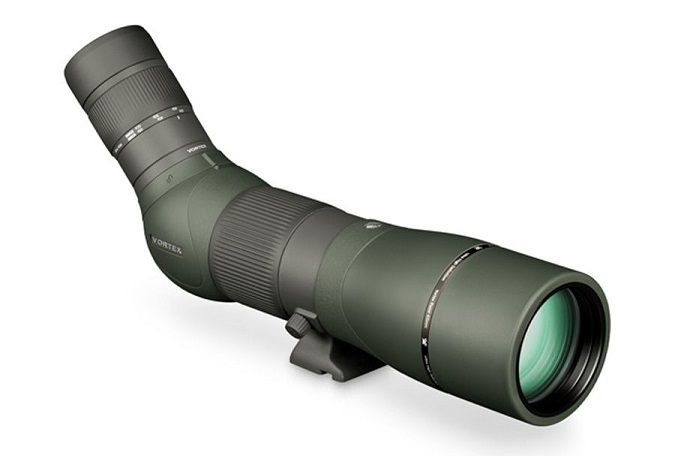 Setting a new standard in high-end optical technologies, precision craftsmanship, and ultra-sleek functionality, the newly engineered Vortex Razor HD 22-48x65 spotting scope is one of the finest spotting scopes on the market. Premium HD glass lens elements, painstakingly hand selected and precision-ground to exacting standards matched with a sophisticated triplet apochromatic lens system deliver brilliant, razor-sharp, true to-life views. Exterior lenses are protected by ArmorTek - an ultra-hard, scratch-resistant compound that repels oil, dirt and the corrosive salts of fingerprints. Fully multi-coated with scratch-resistant XRPlus premium coatings for extremely high resolution and optimal light transmission. A die-cast magnesium alloy body with rubber armouring ensures strength, durability and lightweight performance and the increased depth of field over the previous Razor spotting scopes allows the use of the helical/barrel focus system. The new Vortex Razor HD 22-48x65 spotting scope is 100% waterproof, fogproof (purged with argon gas), dustproof and are covered by the Vortex Unlimited Lifetime Warranty. Includes FREE carry case. Waterproof: Optics are sealed with O-rings to prevent moisture, dust, and debris from getting inside the spotting scope. Fogproof Argon gas purging guarantees superior fogproof and waterproof performance. ArmorTek: Exterior lenses are protected by ArmorTek - an ultra-hard, scratch-resistant compound that repels oil, dirt and the corrosive salts of fingerprints.